He’s an eco-friendly, improvisational, sometimes philosophical, patchouli-soaked quipster. AJ’s organic approach is refreshing and his poetic stream of consciousness style makes for a colorful and unforgettable comedic experience. His audience (much like the Deadheads) are finding him through alternative venues such as music festivals, head shops, and record stores. 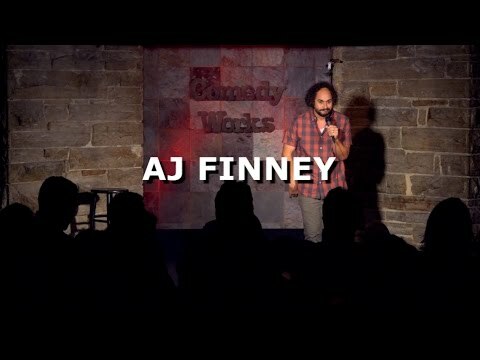 AJ joined TJ Miller on his Meticulously Ridiculous tour in 2015. In 2014 AJ was crowned “Best of the Midwest” winner at Gilda’s LaughFest in Grand Rapids. He was also featured on the FOX television show Laughs, and was one of the 100 performers chosen for Season 8 of NBC’s Last Comic Standing. In 2013 he was a semifinalist in Comedy Central's Up Next. He was a finalist in the 2011 San Francisco International Comedy Competition. He was voted “Best in Fest” at the 2011 Detroit LaughFest and was a finalist in HBO’s Lucky 21 comedy competition. AJ is an effective and engaging storyteller with a rhythm that quickly pulls you into his world. You'll laugh until you leave and then later you'll laugh again.